My fiancé and I set off to explore the South Island of New Zealand on an eight-day road trip that coincided with the wedding of dear friends. Using online travel blogs and friends’ recommendations, we built our jam-packed, eight-day driving itinerary, trekking from Wellington (site of the wedding) to Queenstown. The waterfront in Wellington harbor, on the North Island. Getting to New Zealand was the tough part of the trip. The series of super long-haul flights was draining. We arrived in Wellington late afternoon and were energized seeing friendly faces waiting for us. We didn’t experience much jet lag since the 18-hour time difference between NYC and NZ allowed us to nearly catch up to our normal patterns. After a good night’s sleep, we joined our friends on their walk to work through Central Park in the Brooklyn neighborhood of Wellington. We ended up on Cuba Street, one of the main roads in Wellington which has many cafes, restaurants and shopping. You’ll see references to the island of Cuba such as the Fidel Cafe, but the street was actually named after the 1840 settler ship of the same name. Our friends were off to work, and we continued towards the Wellington Waterfront Walk in Oriental Bay. 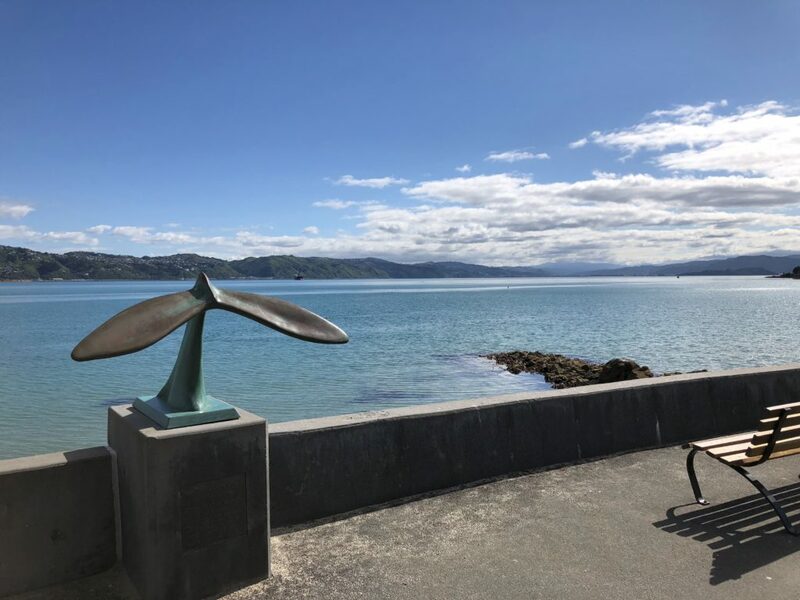 The waterfront walk and park are home to the famous “Solace of the Wind” and “Whale Tale” statues. We walked along Oriental Bay and stopped for coffee at Babylon Beach, a cute retro beachside cafe and restaurant. Service was friendly, coffee was great, our cranberry muffin was super-moist and delicious. Then there’s the museum. Te Papa Tongarewa national museum is where our good friend Miri works. The museum houses and exhibits are dedicated to showcasing the unique Maori and Pacific Island cultural history as well as its treasures. We started our personal tour at the impressive Te Marae (place of encounter) and wharenui (meeting house). 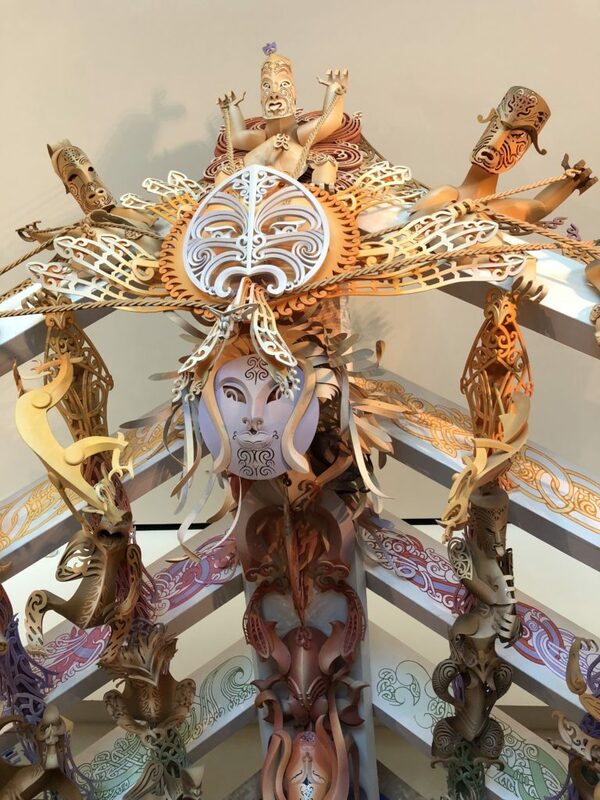 The unique sculptures on the marae tell the genealogy and story of various Maori gods and forefathers, including Rangi (Father Sky) and Papa (Mother Earth). Other permanent educational exhibits include a preserved giant squid and an interactive “earthquake house”. We were lucky enough to also take in the new Gallipoli exhibition which tells the story of New Zealand’s role in this infamous World War I battle. Giant, lifelike sculptures created by the artists at Weta accompany engaging interactive installations to bring the history and true stories of kiwi soldiers, nurses and families to life. We highly recommend checking out this amazing exhibition. We were also lucky enough to get a firsthand look at the Hinatore Learning Lab, the museum’s modern educational facility which Miri launched recently. She walked us through the center which offers learners of all ages hands-on experiences using a variety of state-of-the-art digital technologies. Maori sculpture at Te Papa Tongarewa museum in Wellington, a must-see treasury of indigenous art and culture. Walk along Commercial Street to the Wellington Cable Car entry. For a reasonable price, you can take in the sights as you ride the funicular up to the Botanic Garden, Cable Car Museum, Space Place (at Carter Observatory) and Zealandia (via free shuttle). The view of Wellington and the harbor were spectacular. We walked some of the garden trails and stopped in for a snack and glass of wine at the delicious Kowhai Cafe. At the end of a long day, we met our friends for drinks at Golding’s Free Dive Bar down a hidden alley off the main street. The setting is relaxed and hip, definitely inspired by a typical US dive bar. Goldings offers an impressive selection of local craft beers and wine. Happy hour offers include buckets of puffy cheese balls and other unusual (but addictive) NZ bar snacks. In case you’re hungry for more than a puffy cheeseball, you’re also free to order in Pizza Pomodoro just across the way. Dinner was at delicious Loretta Restaurant. This was one of our favorite meals of the trip. Service was awesome and they were especially kind to accommodate a large walk-in group. We all shared many of the entrees ranging from pizza to veggie bowls; everything was fresh and full of bold flavor. This is a must for any foodie. Our next stop was to pick up our rental car at Omega Car Rental in the Miramar neighborhood near the airport. We reserved the rental through PlanIt.NZ who offered us a very reasonable price for our week-long rental plus a customized itinerary. A GPS was a must for us and we would highly recommend for anyone. The attendant walked us through driving tips and warnings; everything is backwards for Americans. The first few hours were the hardest as your brain and instincts have to adjust to sitting in the right-sided driver seat and being on the left-side of the road. We practiced our driving around Miramar and passed the Weta Studios and Loca Boca Mexican. We highly recommend Loca Boca which serves up delicious and authentic Mexican food in a friendly atmosphere. Early the next morning we made our way to the Interislander Ferry. The ferry crosses the Cook Strait between Wellington and Picton. The queue at the terminal was pretty long but the vehicle check-in onto the boat was quick and easy. We were quickly introduced to the winding narrow roads which would become all too familiar throughout our trip. In order to get to our first Airbnb in Nelson, we drove along Route 1 and then Route 6. About halfway, Route 6 reaches the Pelorus Sound in the quaint town of Havelock. We stopped for lunch at Captain’s Daughter in Havelock, mussel capital of New Zealand. The menu was varied but as Havelock is known for its huge green shell mussels, we opted for the local specialty. We sat on the outside terrace eating our mussels and taking in the lovely view of the rolling hills, preparing for the next segment of our windy two-hour drive to Nelson. Hiking the gorgeous Te Pukatea track along the water in Abel Tasman National Park. We arrived at the Airbnb exhausted from the early morning ferry ride and the long drive. We were quickly soothed by the beautiful sanctuary Tasman Farm Luxury Wellness Retreat Ruby Bay. Our hosts were very friendly and accommodating, welcoming us with freshly picked fruits and spices for tea from the farm. They gave us recommendations for dinner and suggested a hike to Wharariki Beach. We had a lovely dinner at Jellyfish Restaurant & Bar on the Mapua Wharf. Jellyfish has beautiful views of the water and was a perfect spot to catch the sunset. There are a few other restaurants and shops in town which were closed by the time we arrived for dinner. Next morning, we drove over to Kaiteriteri Beach just south of Abel Tasman National Park, where tour companies offer a variety of activities and excursions into the Park. The day was not ideal for kayaking and hiking so we ended up driving north towards Cape Farewell and Wharariki Beach. Along the way we stopped over for a break from driving at the Te Waikoropupu Springs. What a lovely surprise — the walk into the park was truly magical. 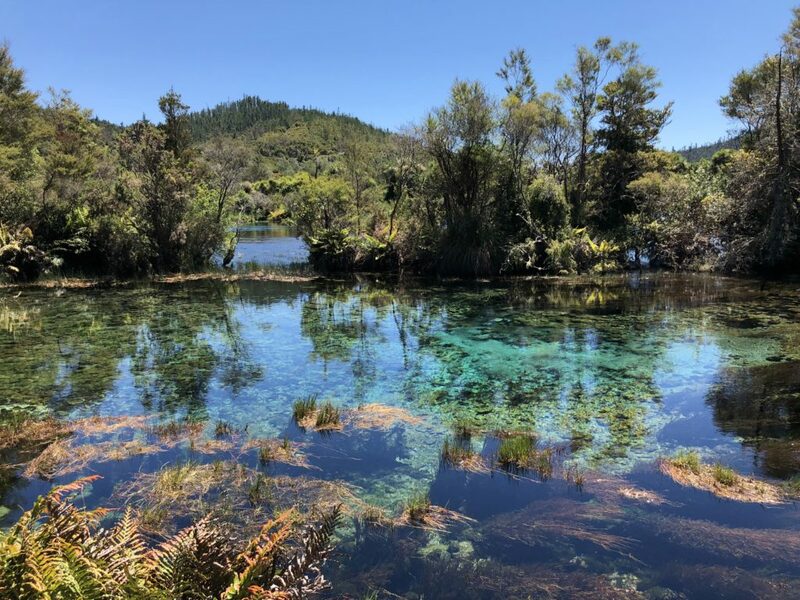 Te Waikoropupu springs, spiritually significant to the Maori people, are known for the clarity of the water and the volume of water discharged. As we continued on the road, we passed the famous “Mussel Inn” in Onekaka which our good Kiwi friend Duncan had raved about. This low-key restaurant, bar and music venue just off of Highway 60 was just the stop we were looking for. As the website suggests, it is “very subtly sign posted but can often be recognised by the many cars parked on the roadside”. Great selection of beer and savory pies. We chatted with a German couple on holiday who were driving north towards Picton. They gave us some suggestions on hikes at Cape Foulwind and Lake Matheson. After our delicious lunch and conversation, we continued driving towards what we intended to be a lovely visit to Wharariki Beach and Cape Farewell. Where we actually ended up was parking at Puponga Point and walking along the south side of the mud flats of Farewell Spit. It was a bizarre landscape, feeling like a far away planet with no signs of other human life and zero shade for miles. Don’t do this unless you are filming a science fiction piece. We were too exhausted to continue after our mud exploration but based on our searches online, Wharariki Beach and Cape Farewell are very much worth the visit. Since we only had half a day to explore, we set out early and picked up sandwiches in town for lunch. When we arrived at Kaiteriteri Beach again, the super friendly Kim helped us book a half day excursion to Anchorage with Abel Tasman Sea Shuttle company. The water taxi ride was fun; some choppy waters along the way depending on the weather. The taxi gave us some photo ops near Split Rock at Apple Tree Bay and by the seal colony resting on the rocks of Adele Island. We continued on and were dropped off for our hike at Anchorage Beach. From there we hiked along the Pitt Head and Te Pukatea tracks to take in the Pitt Head Lookout and Te Pukatea campsites. The trails were lush, full of silver ferns, and offered perfect views of Torrent Bay from various lookouts. We spent about two hours exploring the trails before heading back to have lunch at the picnic area on the main beach. After lunch, we had some energy and time before the water taxi pick-up so we decided to head over to the track leading to Cleopatra’s Pool, a beautiful natural rock pool and moss-lined slide. Our next main stop was Franz Josef, but we decided to stop and rest overnight in Westport. We arrived at our Airbnb around dusk and were pretty disappointed with the stay so we won’t elaborate. Our German friends from the Mussel Inn had recommended an early morning hike to Cape Foulwind, a gorgeous coastline trail. We started just before sunrise and took in the beauty of Tauranga Bay. Cape Foulwind was named by Captain Cook when he encountered bad weather at the spot around 1770. Unlike its name, the beach and trails along the coast were absolutely breathtaking. We started the trail near the Tauranga Bay Seal Colony Car Park. We were able to see a few seals resting on the rocks on the beach but were careful not to disturb them. We continued onto the paved trail and soon came upon the first lookout towards the natural bird sanctuary that is Wall Island, home to thousands of sooty shearwaters, fairy prions (t?t? Wainui), white-fronted terns and red-billed gulls. The next lookout was of the camouflaged Tauranga Bay fur seal colony. This is definitely a sight to see. The coastal walkway continues along undulating farmland, granite bluffs and grassy downs soaring over the water and beaches below. It’s a fairly easy but long 2.5-hour return ending just after the Cape Foulwind lighthouse. We encountered plenty of wekas (flightless bird) and very vocal tuis along the path. We were fortunate to greet a team of wild horses out to graze and have good, long back scratches on the fencing posts. Note to the next traveler — be sure to bring water and a snack on this trail. It is fairly easy but long, especially since the views are so spectacular you’ll slow down for lots of pictures and just to take in all the beauty around you. Afterwards, we stopped in at Underworld Adventures to have breakfast which was well-deserved. The cafe serves food all day and also offers glow worm tours (which we did not do). As we continued on the road, we happened upon a roadside outdoor Fox River market. A live band played in the background while local artisans sold their work. There were plenty of options for food and we opted for some delicious homemade ice cream. Next stop on our way to Franz Josef was to see the famous pancake rocks and blowholes at Punakaiki. Thirty million years of water and air pressure resulted in hundreds of heavily eroded limestone towers where the sea bursts through several vertical blowholes during high tides. The site is very touristy but it’s an easy 30-minute return along a well paved walkway. This is a sight not to miss on a visit to the west coast of the South Island. -After a scary, foggy pre-sunrise drive, we knew we were getting close to Franz Josef because we saw Mt. Cook rise in the distance. The ski town was brimming with activity when we arrived and is full of hotels, camping sites, backpacker accommodations, restaurants, shops, touring companies and a supermarket all in the center of town. We arrived early evening and checked in to the affordable and very comfortable Scenic Hotel. The front desk was very friendly and accommodating. We woke up to a beautiful view of Aoraki a.k.a. Mt. Cook and the snow tipped peak of the glacier. Weather delayed our morning heli-hike to the glacier so we decided to visit the small town of Okarito, where we were told you might encounter the rare kiwi bird. We spent about an hour on the Okarito Trig Walk. It was a nice leisurely walk through the wetland and coastal forest. No kiwi sightings for us but we did meet some fellow Americans who suggested an early morning visit to Lake Matheson, a reflecting lake near the Fox Glacier, for the next morning. We awaited our afternoon heli-hike to Franz Josef and soon were suited and geared up and ready to head over to the helipad. As neither of us had been in a helicopter, we were very excited and slightly nervous. Our group was split into two helicopters for the ride up to the glacier which was a short but exhilarating 5 minutes. The pilots flew in close to see some of the mountain features including a waterfall cascading from the top of the glacier. We landed on what seemed like the edge of the glacier ridge line and carefully dismounted. We held on to ropes to steady ourselves from the helicopter take off. From there we strapped on our ice cleats and began our hike. The hike itself was amazing. We spent about two hours climbing, walking, and exploring as we went along. The sun was shining and, if it weren’t for safety, we would also have stripped down to shorts and tees along with our guide. The walk was mildly challenging in some spots but never overly strenuous. The ice is pristine white but also many shades of blue along the crevasses and cracks. We heard two or three thunderous claps as a new block of glacier succumbed to the sunshine and fell from the Empire State Building-high topmost part of the ridge above us. The ride back down was just as stunning. We stayed a while longer at the base station and enjoyed the complimentary hot sauna pools. Although a bit pricey, the heli-hike was definitely worth every penny. After a much-needed night of rest, we got up early to start our 3.5-hour drive down to Wanaka where we had arranged a Maori experience at around noon. The drive was beautiful as we continued through the Mt. Cook National Park and into Mt. Aspiring National Park along the Haast Pass. We stopped over for a break from the drive at the Roaring Billy Falls. It’s a short and pretty walk which ends at the rocky coastline of the Haast River. Like most of the water anywhere on the South Island, the water was pristine and clear enough to see to the bottom. Had it been warmer, I would have been tempted to jump in, clothes and all. We opted for some silly photo ops and skipping the smooth rocks that laid at the base of the of the river across the clear water of the Haast. After a short while, we were back in the car and continued our journey to Wanaka. As we neared our destination, the last stretch of the drive past Lake Hawea was spectacular. The size of the lake is incredible and the bright blue hues of the water on that clear day were breathtaking. Maria gets lesson in being a Maori warrior from Wanaka Joe, a Maori cultural guide in Wanaka, South Island. “Wanaka Joe” was going to teach us a bit about the Maori culture and history, and had given us very specific instructions of how our introduction was to take place. We were to walk or drive to the parking area by the Wanaka tree and find two orange cones. Between the cones we would find a specific wooden branch which we were to present to Joe who would be dressed in full M?ori clothing and adornment – k?kahu M?ori. When we finally found the location, we were greeted by Joe in traditional M?ori custom, the haka. It was amazing. He performed a powerful haka for us which drew a small crowd on the otherwise quiet beach. We were entranced as Joe moved towards us as he performing the haka. Once we presented the branch to Joe, he accepted it and then greeted us to his land of Wanaka with a hongi — a traditional M?ori greeting. Joe is a terrific guide who spent about an hour with us by the water educating us on Maori culture and history of the people, the land and their spirit in today’s world. His enthusiasm, knowledge and respect for his culture is contagious and inspiring. Do yourself a favor and visit Joe if you find yourself in Wanaka. We stayed a while taking pictures by the Instagram-famous Wanaka Tree (one of the most photographed trees in NZ) with ice-capped mountains in the background, feeling once again in awe of the natural beauty. We walked around the small town of Wanaka; there are plenty of places to shop and many choices for food. We wound up at a local pub before hitting the road again to Queenstown, our final destination. The remaining hour ride from Wanaka to Queenstown was another winding, treacherous yet beautiful ride. We were happy to finally arrive at our Airbnb along Route 6A – Franton Road along the Lake Wakatipu shore. We were taking a Real Journeys bus tour to our Milford Sound overnight cruise, recommended to avoid 4-5 hours more intense mountainous winding roads. We were incredulous that the charter tour bus would make it around some of those tight corners. But we are here to tell the story. The ride itself felt very long but our Journeys tour guide kept things moving with lots of interesting tidbits and facts about what we were seeing. We stopped several times for breaks including a long lunch stop in the cute town of Te Anau and walks to stretch our legs at scenic spots including Mirror Lake and Chasm Waterfall. 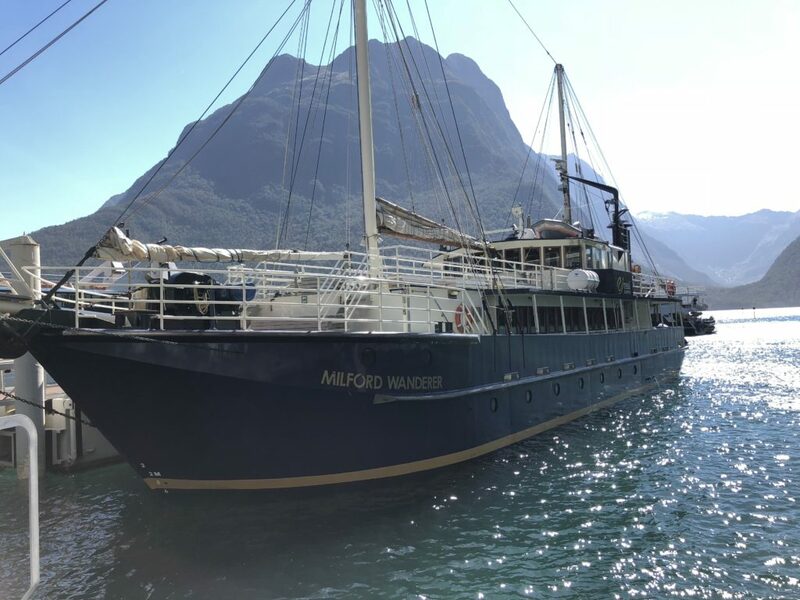 This ship was our overnight homebase to explore Milford Sound and Fjordland National Park, with Real Journeys. The vessel has enough areas in which to explore and hang out — whether indoors within the main cabin or outdoors on the bottom or higher decks. We settled in, received a small welcome message and safety briefing and then prepared for a short hike on the Milford Track. The choice of Sandfly Point as a hiking locale seemed a bit cruel as it was full of bothersome sandflys. It was a nice enough hike but it would have been more enjoyable if we were covered from head to toe to protect us from the annoying bugs. Back on the boat, we had the option of taking a swim off the side of the boat before dinner. We decided a nap was the best choice. Dinner was a nice three-course meal served by the ship’s crew. We were exhausted by the long bus ride and, perhaps feeling a bit seasick, called it an early night. We woke up pretty early to the 6am alarm ringing through the boat and had an hour to get ready, shower and pack up before enjoying a continental breakfast spread. During breakfast, the crew strips beds and ensures everyone is packed up. Our last two hours were spent up on deck taking in the amazing views of the Fiordland National Park. We stopped in close to several waterfalls and tried to catch sight of fur seals, crested penguins and birds swimming and hanging out along the shores. The most special moments were the entire crew and guests gathered on the top deck trying to spot three Southern Right Whales making a rare appearance in the sound. With hushed voices, everyone carefully scanned the waters around the boat… we were treated to the sight of a few blows and tails flipping up as if to say hello. It was all over too soon. The bus ride and the cruise, though pricey, was well worth the experience and sights in this majestic place. We arrived back to Queenstown later that day and checked into our hotel – the Ski Lodge Hotel. There was nothing too special about the hotel and, if we did it again, we would have taken more time to find something closer to the center of town. We treated ourselves to a dinner at Michelin starred chef Josh Emett’s restaurant, Rata. The meal was absolutely delicious and the service was wonderful. Our server spent time with us not only explaining the extraordinary dishes, but also shared some fun facts about the adventure sport, vineyards and historic mining sites in and nearby Queenstown. After dinner, we took a leisurely stroll around the center of town and picked up an ice cream at Mrs Ferg Gelateria. We ate our ice cream on the shores of the Lake Wakatipu, set against a dramatic setting sun behind the Southern Alps. This was our last night on the South Island and we knew we would be sad to leave. The next morning, before returning our rental car and flying back to Wellington, we had a lovely breakfast at Ivy and Lola’s. It is located close to the water and the food and service was excellent. Still having a bit more time before our flight, and feeling a bit lame for not doing anything too adventurous in Queenstown, we decided to be daring and jump onto a couple of Segways. Admittedly Segways are not the most “extreme” of sports but nonetheless, we had a super fun time riding through the beautiful Queenstown Botanical Gardens with our tour guide from Segway Tour of Queenstown. We packed up and said our farewells to Queenstown and were soon back in a plane. Is our trip for you? It was quite a trip in a relatively short amount of time. We would have never imagined how much we could pack into eight days. Plus, we had so much fun and met so many amazing people. There is so much to see, and it seems everywhere you look, the view is more gorgeous than the last. New Zealand is such a beautiful country and the South Island is a very special place. We hope that everyone gets a chance to visit someday and experience their own amazing adventures. Was an honour and pleasure to host you both in the Maori Whakata/Welcome to Wanaka. Welcome back anytime to this wonderful part of the world.